You can imagine our surprise when we got a call in November from a very important (and jolly) man who had a big challenge for us. With Christmas fast approaching and a new warehouse to fit out in just a few short weeks, Santa knew he needed some expert assistance to ensure all the toys for the children living in the UK would get out on time this year. Simply put, Santa needed our help urgently – and as always Cubex Contracts was ready to jump in and help. Santa told us about the large warehouse he’d just purchased on the Northampton Business Park. Apparently his operations in the North Pole have had to increase rapidly to accommodate the growing number of children on the “nice” list and he was running out of storage space for all the toys. He worked with his head elf “Elvis” to come up with a plan to ease the pressure on the NP facility and they decided that by purchasing warehouses all around the world to act as distribution hubs, they could create enough additional storage space for years to come. It just so happened that one of the new “hub” warehouses is in Northampton, right up the road from Cubex Contracts HQ – fancy that! Need to increase toy storage space and have staff facilities area for the elves too, warehouse is nice and big but there is too much wasted space. The toy storage area needs to hold lots of boxes that are brought in and stored on pallets, these areas need to be designed in such a way that my elves can work safely in there on a daily basis. Accessibility and their safety is very important! The elf facilities need to include toilets (and one for me too! ), as well as a kitchen area. As the elves are on the “short” side all facilities will need to be accessible. It would be nice to have a dedicated space for team meetings, a place where we can keep in touch with the other hubs and Santa HQ in the North Pole. We will also need some new furniture and one of those large screens! When goods come in and go out we need plenty of space for unloading and loading. Lot’s of bays are needed as we often get multiple deliveries at once, and electric doors would be nice too for quick access. My sleigh and reindeer also need to be able to park somewhere safely- we can’t have anyone seeing that before Christmas! A large scale mezzanine floor would be designed and installed into the warehouse – with areas for storage and elf facilities incorporated too. The mezzanine to be fire rated with 60 minutes fire protection to the elements of structure and smoke detection underneath. Fire protection will be column casements and suspended ceiling with LED lighting. We concluded that 4.8kN should suffice. 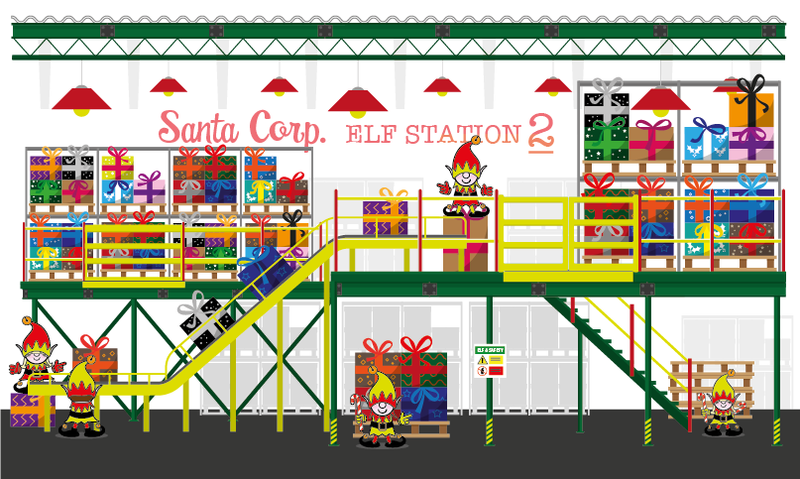 We also recommended the mezzanine floor to have two staircases, because of travel distances to nearest safe place in an emergency is over 25 metres – and elves can be a bit slower due to their little legs! As the boxes come in and are unpacked they would be stored on a combination of shelves on the mezzanine (for light goods), and a racking system would be included on the floor underneath (for heavier goods). Racking below the mezzanine would be built to house the heavier items/boxes – including reindeer food. The 2700 clear entry racking would allow Santa to store 2 pallets wide per beam level, totalling at 1200 between each beam level, therefore maybe only 4 beams per bay of racking otherwise the floor will be mega high. Aisles would be designed to allow a counterbalance fork truck access. Wrapping station would also be installed on the mezzanine, close by to a conveyor belt system to carry the boxes down to the loading and dispatch bays. Pallet gate added so deliveries can be lifted up onto the mezzanine, with a steel chequer plate to receive the pallets and prevent damage to the floor during loading. Delivery area to include dock levellers, and dock levellers also to be installed in the dispatch area. We also suggested a canopy was added to keep Santa and his reindeer dry (and hidden!) during loading. Toilet and welfare facilities to conform to the Equality Act provision, built to a bespoke design to accommodate short sized employees as well as Santa. New meeting room table and chairs, as well as a Smart screen to keep track of operations on Christmas Eve. We also recommended the meeting room include natural lighting tubes and sky panels, with North Pole scenes to be installed – to keep the elves festive spirit high and to minimise elf absence due to feelings of home sickness. A first aid room because even when a robust “Elf and Safety” policy is at the heart of a business sometimes accidents do happen, so a dedicated space for their First Aid appointed elf would be useful. Showers to allow those elves that run or cycle to work would have a place to freshen up before the start of their shift. Santa was delighted with our proposal and gave us the go head to get the project underway. We immediately appointed a Project Manager, organised a project plan, gathered a team of our very best and trusted contractors, and called a site meeting. During the next few weeks of the project our entire team, both on site and back at Cubex Contracts HQ, worked hard to make sure every detail and “to do” list was completed to our high standard. Santa was kept up to date at all times and even popped down occasionally to have a peek at how the project was progressing. He was especially excited when the conveyor belt was installed – but we can’t say too much about that, other than we really do recommend that only boxes go on conveyor belts and not… erm… people. Naughty Santa! Once all the main structures and facilities were installed our team of decorators came in to ensure the new hub was branded in Santa red and festive green – this made all the elves happy and feel at home in their new work space. Santa was delighted with our work and I think the smile on his face in the “hand over”photo below says everything! “Cubex Contracts took my empty warehouse and turned it into the distribution hub of my dreams. I am delighted with the work they have done, and the communication during the project. Everything was completed to the highest of standards and I couldn’t be happier. Thanks to Cubex my new warehouse is open and ready in time for Christmas. I couldn’t have done it without them. Thanks Cubex! We were delighted to take up the challenge and help Santa increase his storage space in time for Christmas! Of course you’ve probably guessed that this story is just part of our Christmas campaign to raise awareness of how useful a mezzanine can be for your business – but, if like Santa you need to make better use of the space above your head, increase storage space and improve efficiency in your business – we don’t think there is a team better for the job than us. Call Cubex Contracts today on 01933 460422 – we create space for business to grow, even if you happen to be Santa!